Pete Metzelaars will return Sunday evening to familiar territory. Metzelaars will be working in Sun Life Stadium in Miami, Florida as the offensive quality control and assistant offensive line coach for the Indianapolis Colts at Super Bowl XLIV. It’s the same place the Colts won Super Bowl XLI in 2007. It’s not just the setting that will be familiar. 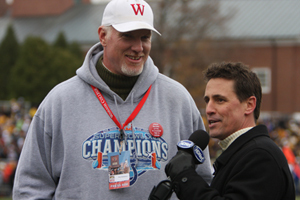 It will make six trips to the NFL’s championship event for the 1982 Wabash graduate. 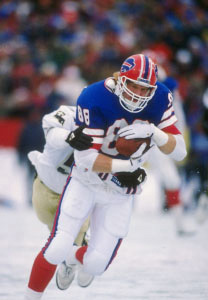 Four times he was on the field as a tight end for the Buffalo Bills. Metzelaars’ first experience in a championship game came at Wabash. He made the decision to come to the College one year after the Little Giants played for the NCAA Division III football national championship. During his four-year run at Wabash, he starred on the football field and on the basketball court, eventually leading the Little Giants to the DIII national basketball title as a senior. Playing at 6-8 and 235 pounds, Metzelaars scored 45 points in the basketball championship game, an 83-62 victory over Potsdam State. He was named the National Association of Basketball Coaches Division III Player of the Year and set single-season and career field goal shooting percentages that still appear in the NCAA record books. 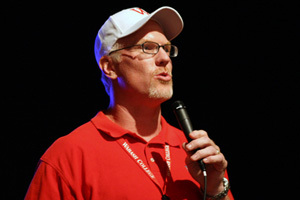 Parrish, currently the Ball State University head football coach, took over at Wabash in 1978 after serving as an assistant on the Little Giants’ 1977 national runner-up team. Parrish left after the 1982 season, accumulating a 42-3-1 record. He had a successful career as both a head coach and an assistant in the college ranks before joining Jon Gruden’s staff in Tampa Bay in 2002. He helped guide the Buccaneers to the 2002 Super Bowl title. The ability to play two sports played a major roll in Metzelaars’ decision to come to Wabash. Metzelaars steady play for Wabash — 77 receptions for 1,196 yards and nine TDs and a four-year record of 32-3-1 — drew the attention of the Seattle Seahawks. He was selected in the third round of the of the 1982 draft, spending three seasons at Seattle. At the end of the 1985, Buffalo general manager Bill Polian traded with Seattle to bring Metzelaars to the Bills. Metzelaars would go on to play in four consecutive Super Bowls from 1991-1994, but never got a Super Bowl victory after closing out his career with stints in Carolina and Detroit. Polian, who came to the Colts’ organization in 1998, helped Metzelaars join the Indianapolis staff as the offensive quality control coach in 2004. Metzelaars and Parrish have both experienced the thrill of coaching in a Super Bowl victory and agree on the approach. With all of his championship experience, Metzelaars joked when the Colts made their first trip to Miami for the Super Bowl in 2007, he did not have a lot of requests for advice. “I don’t think anyone really wanted my advice since I didn’t have the best track record with four losing efforts,” he said. “Seriously, we had three or four players with Super Bowl experience when we won in 2007. (Defensive line coach) John Teerlinck was part of two Super Bowl wins in Denver and our offensive coordinator, Tom Moore, was part of two championships in Pittsburgh. We just tried to remind the players to keep the distractions as limited as possible. Metzelaars’ Wabash career gives him a common connection with a current Colts player. Pierre Garçon is in his second season with Indianapolis after playing at Division III Mount Union College in Ohio. The DIII connection has made for some fun exchanges. Metzelaars and Garçon are proof Division III players belong on the biggest stage. “If you have the talent and ability and you make the most of your opportunities, you can succeed in anything,” Metzelaars said. “Pierre is a perfect example. Some people take advantage of these opportunities; some don’t know what to do or how to do something when opportunities are presented. It is a huge jump in terms of what and how you need to perform in the NFL. Petty and Parrish agree about the hard work needed to succeed. Wabash basketball coach Mac Petty discusses Metzelaars' attributes that have led to his success in the NFL. Metzelaars returns to that stage Sunday for the sixth time. Photos - (top right) Metzelaars being interviewed during the 2008 Monon Bell telecast on HDNet. (Middle left) Metzelaars played 16 seasons in the NFL, including 10 with the Buffalo Bills. (Bottom left) Metzelaars returned to Wabash as a colloquium speaker for his 25th class reunion.